A Matter of Interpretation, by Antonin Scalia. This review is presented in conjunction with a view by Catherine Crier different from that of Antonin Scalia. Scalia writes that U.S. courts, sadly, "have no intelligible, generally accepted and consistently applied, theory of statutory interpretation." He describes as principle, dating back to 18th century England, judges interpreting a statute "to give effect to 'the intent of the legislature'." Judges, he adds, are supposed to resolve inconsistencies "in such a fashion as to make the statute, not only internally consistent, but also compatible with previously enacted laws." Scalia describes his adherence to textualism. Textualism means interpreting the text of written law without going beyond the intent of those legislators who made the law. He writes that judges have no authority to pursue "broader purposes." He describes this as not "strict constructionism." Strict constructionism, he writes, is "a degraded form of textualism that brings the whole philosophy [of textualism] into disrepute." A strict constructionist might rule that use of a gun in a crime includes trading the gun for cocaine rather than as a weapon. Scalia takes a common sense approach to language rather than a strict interpretation. If it is said that someone uses a cane it is suggested that he walks with a cane rather than his having "hung his grandfather's antique cane as a decoration in the hallway." Scalia criticizes those who give less weight to the intent of the writers of the Constitution than he – those he describes as "devotees of a Living Constitution." He describes them as lacking a principle with which to interpret, and he complains that they open the door for an abandonment of the liberties that the Founding Fathers considered essential. Adherence to an interpretation of a Living Constitution, writes Scalia, is without agreement, and no chance of an agreement, as to "what is to be the guiding principle" of such interpretation. Nowhere in this book does Scalia suggest that his "guiding principle" makes judging as easy as measuring with a yardstick. There is too much to the law and to that which is to be measured. 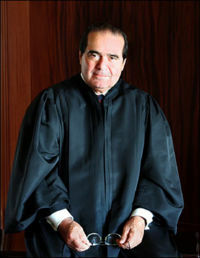 In a January 2006 decision, Gonzales v. Oregon, concerning a state's right to allow doctor assisted suicide, Scalia was one of three dissenting judges, the other two being Roberts and Thomas. Rather than simple, Scalia's full dissent is pages long, with notes. The court ruled that Attorney General John D. Ashcroft back in 2001 exceeded his legal authority in trying to prohibit doctors from prescribing federally controlled drugs as lethal doses under the Oregon Death with Dignity Act. Scalia's dissent, summed up by Wikipedia, was that under Supreme Court precedence deference should be given to the Attorney General's interpretation of the law – Attorney General Gonzales carrying on for his predecessor, Ashcroft. Scalia imposed his assumption that it was illegitimate to prescribe a drug to end suffering and a meaningless continuation of life. He wrote: "If the term 'legitimate medical purpose' has any meaning, it surely excludes the prescription of drugs to produce death."